Between July 15-17, the Office of Naval Research (ONR) and the Naval Sea Systems Command (NAVSEA) hosted an undersea medicine progress review meeting in Durham, North Carolina. 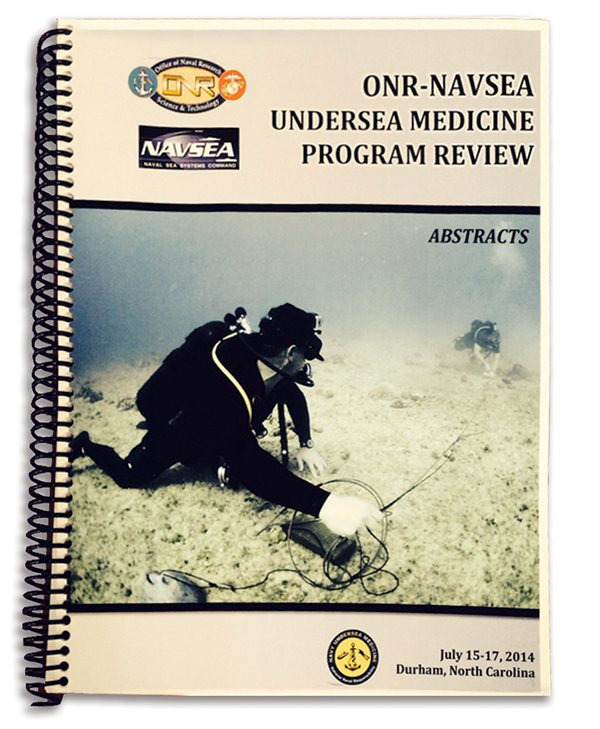 The presentations focused primarily on topics of interest for the Navy, but most of the research also benefits recreational and technical divers. One topic I found particularly interesting concerns the combined effect of increased carbon dioxide levels (CO2) in breathing gas and the breathing resistance that breathing apparatuses impose on divers. If breathing is unimpeded, slightly increased levels of CO2 pose no problem. However, the more CO2 that is inhaled, the less CO2 can be added, and a larger breathing volume per unit of time will be required to wash out the same amount of CO2. This increase of breathing volumes occurs automatically, successfully washing out the metabolic CO2 and maintaining a nearly normal level of CO2 in arterial blood (even during exercise when the internal metabolic production of CO2 is increased). If, however, the external resistance to breathing is increased, as in the case of closed-circuit diving, breathing volume during exercise may not increase enough to compensate for the extra CO2 in the inhaled gas. The result of this combined effect is that part of the metabolically produced CO2 remains in the body (CO2 retention) and the arterial level of CO2 increases (hypercapnia). Divers may choose to ignore the increased arterial CO2 levels and continue diving with the same amount of exertion, or they may compensate for this combined effect by reducing their exercise levels to diminish metabolic production of CO2. Often, divers automatically find some balance between the two, slightly decreasing their exercise levels and thereby slowing the increase of CO2, but failing to prevent it completely. One study conducted by Dan Warkander and Barbara Shykoff through the Navy Experimental Diving Unit exposed divers to controlled levels of CO2, external breathing resistance and heavy exercise at three different levels of CO2 in their oxygen mixes: 0%, 1% and 2%. External breathing resistance was set so that the work of breathing per volume was 1.0 kPa (R1) or 1.8 kPa (R2)—both of which are below acceptable levels according to the U.S. Navy standard. Divers were immersed in water and exercised on a cycle ergometer. Researchers then measured arterial CO2 levels, observed divers for symptoms of hypercapnia, conducted cognitive tests and measured exercise endurance. The criteria for stopping the test included: inability or unwillingness of the diver to continue the test, arterial CO2 levels exceeding 65 Torrs or time limit exceeded. The study is still ongoing, but some noteworthy results have already emerged. At 1% CO2 and R1 resistance, which may be quite common in CCR diving, four out of the 16 subjects demonstrated symptoms of hypercapnia, and one stopped exercising. At 2% CO2 and R1 resistance, five divers demonstrated symptoms, two stopped exercising and one was stopped by researchers for arterial CO2 levels in excess of 65 Torr. At 2% CO2 and R2 resistance, more than half of the divers displayed symptoms and five had to be stopped by researchers. Minute ventilation in most divers was in the range of 50-80 liters per minute (lpm), although some divers increased their ventilation to 150 lpm. Cognitive impairment varied. While some divers appeared unaffected, some did not remember the procedures they were supposed to follow. Still others did not regain full mental acuity ten minutes after the test. The symptoms reported included nausea, dizziness, anxiety, headache and memory impairment. Symptoms occurred suddenly or gradually. Most importantly, some divers remained totally unaware of hypercapnia even when their arterial CO2 levels exceeded 65 Torr. Rebreather divers must be familiar with symptoms of hypercapnia. When they recognize the symptoms, they must immediately cease exercise, switch to a safe source of breathing gas (bail-out) and call the dive off. Because some divers may not experience warning symptoms before they become mentally impaired, CO2 sensors should be built into rebreathers in order to monitor for this silent hazard. ← Who got it wrong, reporter or scientists?